Nice to have to you back, Mark! Columbia didn’t dominate the finale here at Le Tour de France Stage 5 – Garmin did that – but the men in white and yellow did a huge amount of the work in the last hour. Renshaw was brilliant, not afraid to exchange bumps with Hushovd and weaving through Hunter and Farrar with ease, taking time in the chaos to calmly look back to check that Cav was where he was meant to be – ice cool! Garmin looked good – Millar was strong then Hunter launched out of the last bend, Dean took it up but Tyler isn’t back to his best yet after hitting the tar t’other day. It wasn’t an Ale Jet finish either, he’s a drag racer. Cav looked good, sharp, poised – and when he went he looked the winner all the way. Ciolek has shaken off the torpor and Boasson Hagen was there again, but Cav’s back, and crying on the podium – we just love that. Cavendish is overcome by emotion after a hard few months. Photo©Sirotti. “Cav takes everything personally; like the crashes in Suisse and Brussels – and he hasn’t had everything perfect like he did last year. “That’s playing on his mind and he’s a little down in the dumps. He needs to get the old Cav back and everything will happen. “His team looked weaker yesterday; they’re only human. He has lost before so we know he can turn it around. “Yesterday [Wednesday] didn’t go so great. I felt like I’d let the team down when I couldn’t finish off with a win. “But the team has always believed in me. They gave it 100 percent for me today again, and they never gave up on me. “I really wanted to win a stage in the best bike race in the world, too, and now I’ve been able to do that today. It’s amazing. The pressure’s been really intense, It’s been really tough at times, but I want to thank all the people who have supported me though the hard moments. “I’ve got an incredible group of friends and family, and a once-in-a-lifetime team, and they picked me up and all helped me to recover. We got up the Royal Mile before the bollards popped up, this morning, parked on the double yellows and spoiled half a dozen tourist’s pictures – but we don’t care, we need our L’Equipe. 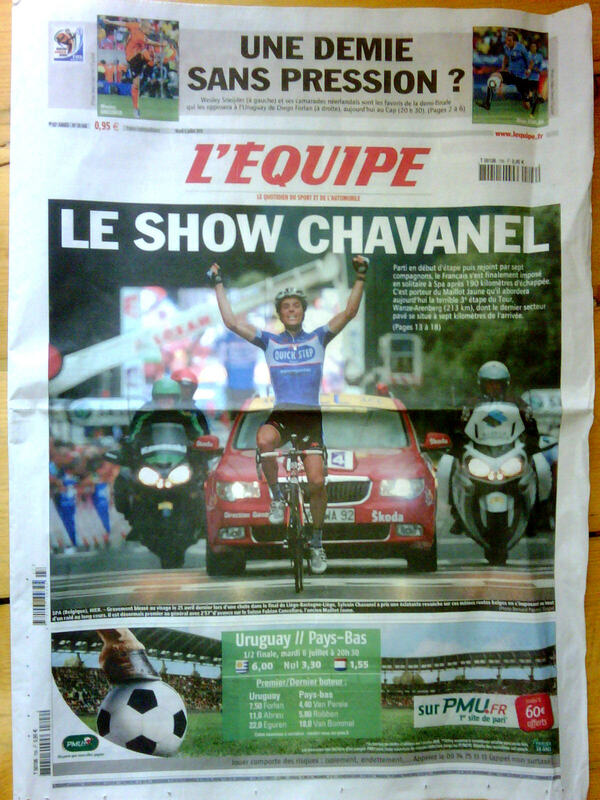 The French like a home winner and Chavanel got the whole front page for stage two – he deserved it. Cancellara seemed to get off lightly for his sins – Viktor is still unhappy about it, though. In fact, Vik reckons that the Tour has descended into terminally boring stages – I guess that’s why he watches it for six hours every day. 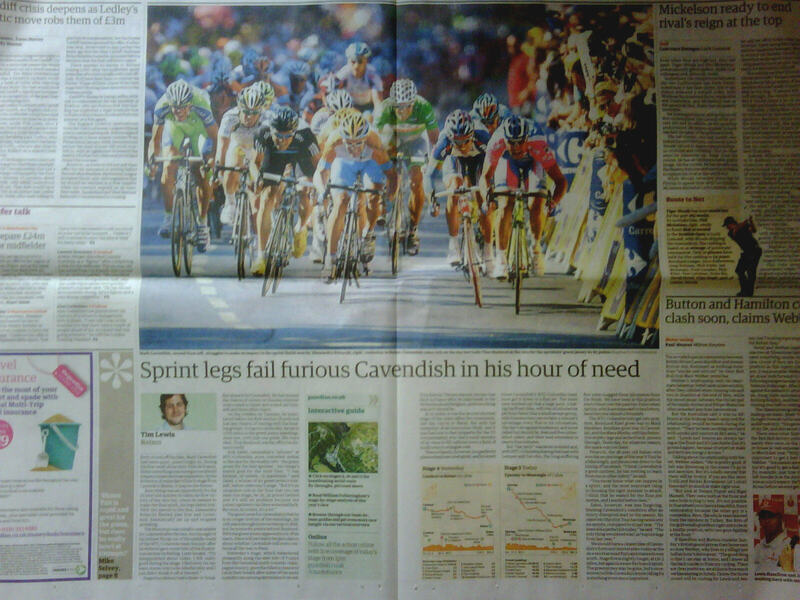 On the subject of newspapers, today’s Guardian has a nice shot of yesterday’s finish; changed days from the 70’s when I had to seek out a Daily Telegraph which was the only paper back then to carry stage results. L’Equipe has tomorrow down as a ‘Baroudeur’ stage – but those ‘sprinteurs’ will want every chance they can get; it’ll be an interesting one, for sure.